This blog lives in that illusive balance, with children who find magic when pulling carrots from the rich earth, who experience wonder when watching water beads rolling around a nasturtium leaf, who are surprised by the warm, sensory bliss of stepping from ice-encrusted winter into the suspended summer of the bright, balmy greenhouse. 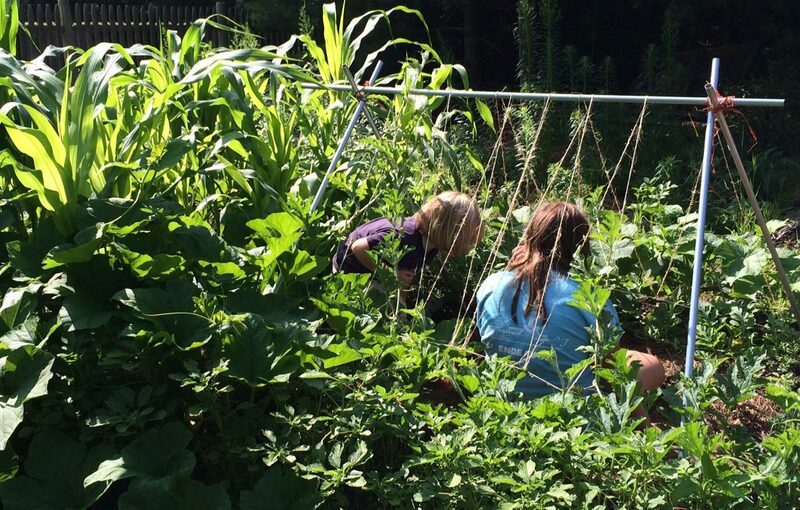 In addition to posts about the experience of gardening at school, I will also write about ways parents can help their children discover the joy of gardening at home and I will share thoughts about raising children both at home and at school. –Third, as adults, we share a responsibility to help children grow, and as caretakers, parents and teachers we dedicate ourselves to nurturing children or, in other words, growing children. While gardening with children is a unifying theme here, I will also write generally about ways we can help children grow. My particular interest is intrinsic motivation. How can we help children find wonder and,springing from that sense of awe, develop capacity for sustained interest? My (almost complete) classroom memoir, A Gift of Wonder, invites readers to join me and my students as we journey together from first through sixth grade while I explore ways to keep wonder alive at each age level. Please follow this blog by clicking the follow button which is at the very end of the blog entries on a computer and in the menu section at the top on a phone. When you do so, I hope you will consider yourself more than a follower, rather a participant. From time to time I will pose questions to spark conversations and I hope you will join in. I am a class teacher and a gardening teacher at The Waldorf School of Cape Cod. I’ve been growing children for 43 years (including 21 as a teacher) and growing gardens for 40 years. Like you, I was once a child myself. I believe our best instincts for being with children come from our own memories of childhood. By the way, this blog has no advertising, nothing to click on except the follow button that will send new posts to your mail box. I want your time here to be peaceful, and contemplative, without distractions. Yet there is one type of click I will encourage– to click into your own memory. Take a moment now to remember, to deeply re-experience, a time from your own childhood when you discovered wonder in the natural world. Enjoy! Hi Kim we are trying hard to raise funds to keep our Steiner early yrs centre alive..The Children’s Garden Exeter in the UK has a crowd funding site. Wondering if you could forward link to people who might want to support us. We have 14 days left to do this. Thank you so much and love your blog! !